Fabricated in the USA in our MoreBeer! Metal Shop you can easily ferment 10-12 gallon batches of beer in these beautiful fermenters! Made from 304 stainless steel and with the ability to hold up to 5 psi of pressure MoreBeer! conicals are the standard by which other conical fermentors are measured. 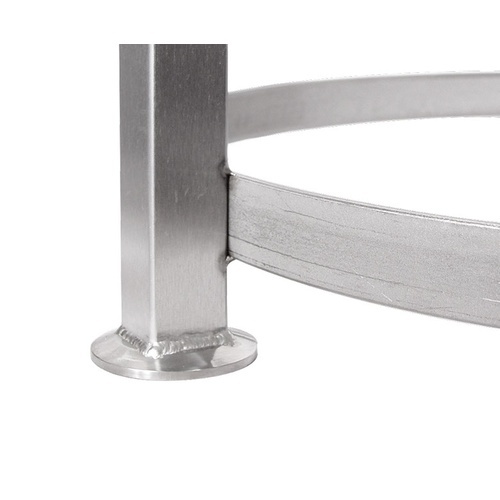 Professional quality Tri-Clamp fittings are welded in place for a lifetime of use and all the hardware is brewery quality. The rotating racking arm allows youto adjust where you are drawing beer from on the inside of the fermenter, a key feature when you have different amounts of trub from batch to batch. The 3" tri-clamp opening on top allows you to easily add hops, oak, fruit, or whatever. We have a great selection of options including let extensions, casters, CO2 pressure gauges, blow-off and thermowell packages. We control all aspects of the manufacturing process and carry all parts in stock. We were the original manufacturer of stainless conicals for homebrewing since the 1990's. MoreBeer! conical fermentors are trusted by Sierra Nevada, Stone, Lagunitas, Samuel Adams, Russian River and host of other breweries for pilot brewing and recipe design. Ability to add options, like leg extensions, wheels, Blow off, and more! The Leg Extension Option (CONP769) is needed if you wish to gravity feed into a keg. 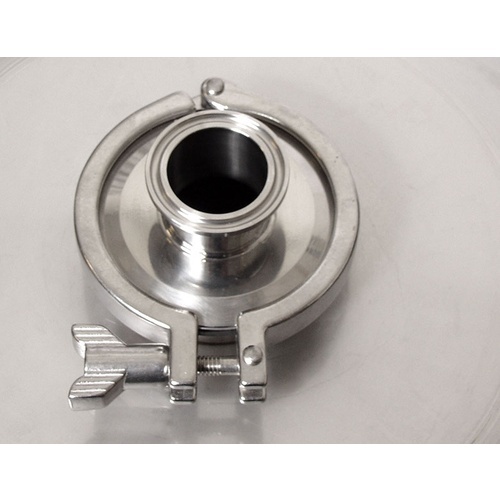 If you would like to use CO2 to push your beer into a keg, you will need the CO2 Adapter Package (CONP775). After much research, chose this as having the best options for the price. The fact it is made in USA was a big plus! Does anyone out there have a good aftermarket/homemade/affordable insulating jacket for this conical? BEST ANSWER: Hi Richard - Rolled insulating foam works great for this application. I am extremely pleased with the quality and packaging of the fermenter. I am giving it 4 stars instead of 5 stars only due to the support team refusing to help me be proactive and prevent damage to the fermenter. I called them and asked about the issue of the rubber pads on the stand where the conical rests coming loose under the weight of a 10 gallon batch. The has been reported a number of times in the many reviews I read, and the reports said the conical was dented when the pads came loose. The reports suggested using epoxy to attach the pads, but there are many types of epoxy. When I called support, they said they were aware of the issue, but it didn’t occur on every unit. I asked them to suggest what I could do to be proactive and prevent the damage should my unit be susceptible, since it would be too late if it occurred. They repeated that not all units have the issue, and said they would fix it under warranty if the issue occurred. But I doubt they would replace the conical due to a dent, even though they could have helped me prevent it. When I opened the unit, the rubber pads were already loose and out of place. I just need to know what type ad adhesive (not what was used) would be effective in fixing it. I would have been much more positively impressed with a response along the lines of “we are aware of the issue and working on it. If you want to address it before damage occurs, we suggest...”.. Instead of partnering with me for the best outcome, I feel they choose to cover up the issue at my expense. I'm very this and the other conical fermenters purchased from MoreBeer! I've purchased several upgrade items for this fermenter - casters, sight glasses, etc. All quality products that were delivered quickly. I had rust on inside of lid after first two batches. The rust spots cleaned up with barkeeper's friend the white scrub pads, and effort, but it seems like this will be a recurring problem. The rust spots are in the same spots, which stand out even when clean against the brushed pattern on the steel. (If I can edit this I'll get a photo next time I pop it open.) This can happen with any good stainless steel, but I am disappointed with the severity of the problem. Were it not for that I would say 5 stars all the way. The gasket has been a strong point so far, and so surprisingly so. While a blowoff hose and pressure transfer kit of whatever sorts are the way to go... the airlock-- impossible to make the rubber plug stay in his stainless port unless you wrap it a few times (and sanitize again) in teflon tape. Then it stays fine. For transfers, the ez bev antimicrobial 3/8" ID, 5/8" OD tubing sold at morebeer fits great on the barb, and it can hold a ball lock connector with a tightened clamp on the other end for pressure transfer. That part is highly reliable. I tried a CIP ball on mine on the second use (which doesn't get the inner lid rust btw) and the only issue is monitoring pressure. The pressure safety valve in the design does vent, but when I stop to check by removing the top TC, there is a lot of pressure built up. The issue with that is: with the CIP ball there is leakage everywhere unless you place the gasket and fully tighten the lid clamp. My plan had been to let the lid sit, unclamped while CIP cleaning, but it doesn't work with this fermentor. I did successfully run a CIP, but I am not confident still in the whole thing and monitor it more closely than I'd like to. Just stuff to keep in mind. The reason I like the fermentor is that it is from morebeer, and morebeer is reliable in all respects. So I'm trying to contain disappointment and work through the lid rust for now.After 3 batches the rust spots on the inside of the lid stopped recurring. I polished them off with barkeeper's friend each time, and they stopped coming back. It looks like there were a few rough spots on the inside lid that are now healed up. I also have come to appreciate the tank-like body of the fermenter. I’ve still not seen any conical as solid, and it’s why I would get another morebeer conical before any other. I’m surprised that they haven’t been outfitted to hold more pressure, given then thick, solid body of the thing—15 psi capability would be so nice! I had to re-attach the rubber pads that cushion the conical when it is placed in its base, and a hot glue gun was definitely the way to go. Everyone should expect to have to do that (unless MB glues them better) but it’s very easy to do. My MB conical lacks cooling capability, but I’ve found a good solution, and because of that, I think it all comes down to the fermentor body that fits into and can be lifted out of its very solid base, a highly functional gasket and band clamp with a proper lid for a tank. If you ever make a jacket for this thing, I’ll be interested in getting one. I bought this second conical almost two years ago to use in my brewing setup at our retirement home. I finally got to put it to use today. A great piece of equipment with a couple shortcomings that don't seem to be getting resolved: As was the case with my first conical, I had a problem with the stick-on rubber pads on the frame that hold the conical in place in the frame. When the conical is filled, they slide out of place under the weight of the wort and the fermenter cone tips out of level, scraping the conical. The problem is easily resolved by cleaning the stick stuff off the pads and frame and them epoxying everything in place. Surprised Morebeer hasn't done anything about this as I'm not the only person to mention this shortcoming. The second problem hasn't actually happened with this unit yet, but I am anticipating that it will. The well-documented/terrible feedback concerning the joint in the lid gasket breaking seems to be unchanged. The costly gasket breaks at the seam with great regularity. Read the gasket feedback. Other than these two problems, the conical is great and easy to use. I have been using this conical since April of 2010. It is a top notch piece of equipment and I am very happy with it! My only complaint is the rubber pads on the stand that keeps the conical in place will slip and come off causing the conical to lean. I was surprised that this was not addressed better with all the improvements that went into the remodel. The first thing I thought after I unpacked everything was, "Wow, this is extremely high quality". I almost bought the Blichmann 14 Gallon conical the week prior. After handling the Blichmann and handling the MoreBeer conicals - the MoreBeer conical easily stands out in quality. I haven't brewed on it yet but I will two days from now: couldn't be more pleased! Takes brewing to the next level. There are few things in a homebrewer's arsenal with more cool factor than a SS conical fermenter, and it is completely justified. 1. I will never have to carry a full fermenter anywhere ever again. 2. Harvesting yeast is a breeze with the large port butterfly valve on the bottom. 3. Tri-clover everywhere is the only way to go. The ease of hooking up attachments to different ports is tremendous, and you don't have to worry about silicone tape or tools to get a tight seal. 4. I can transfer to 2 kegs at once using CO2. My only complaint is that I only have 1. You got to be really serious to lay out this kind of money to replace a couple of glass carboys. Having said that, once you got it you be very happy with it. To use the yeast collector attachment you will have to get extension legs. I have the extension legs on mine and put the whole thing in the spare bathroom in the bathtub with wooden blocks under the legs so as to not damage the tub. It's super easy to clean out using the hose with hot water. Forget any expensive airlocks or blow off tubes. Recommend you just get a stopper with a hole in it, put one end of a hose in the stopper and the other in a jar of sanitized water. Presto, Instant, foolproof, and cheap, blow off tube/air lock. Really enjoy this fermenter. Easy yeast harvesting. Love the fermenter. Minor problems with the stand. I'm in the midst of fermenting my third all grain batch in my new 14 gallon conical. I love the convenience of the thing. Easy to set up and use. Dumping trub and harvesting yeast are both incredibly simple processes now. Transferring beer to kegs with CO2 pressure is a breeze. The beer I'm producing is head and shoulders above the quality of what came out of carboys. I encourage everyone to get one of these things if you can. My only complaint is with the stand that holds the conical. As I mentioned. I'm putting my third batch through the fermenter now. The first two were 5 gallon batches. The current run is 10 gallons. The fermenter worked flawlessly for the first two batches. However with the current 10 gallon batch, the weight of the wort caused one of the stick-on rubber pads on the frame to slip off one of the three points when the conical is cradled by the frame. This caused the conical to tilt to one side, it started dripping from the lid gasket, and most significantly, put a not so nice scratch (small gouge) on the outside of the fermenter (stainless fermenter directly on stainless frame). Other than shoving in a temporary pad, I can't really do much to remedy this situation until the fermenter is empty in a month or so, when I plan to install heavier duty screw=attached pads to the frame. With the top quality of the fermenter build and it's significant cost (which just went up), I would recommend that Morebeer! put a couple more bucks into the pads that cradle the fermenter in the frame. A wonderful product with one small shortcoming so far. 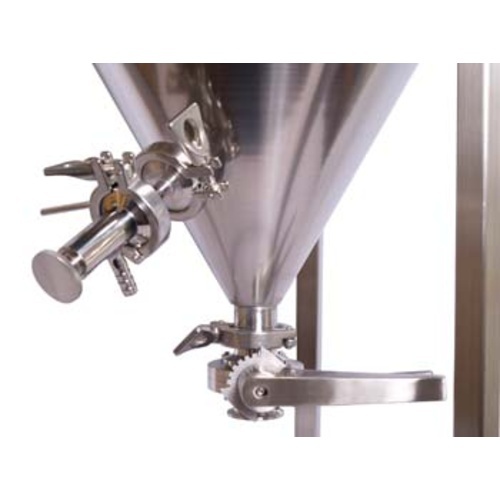 I have this conical as well (Order# 2848560) and I am having the same issue with the fermentor shifting in the stand. It is so disappointing to show off your state of the art brewery only to open a fermenting chamber to display a dilapidated $1000 fermentor. I went in search of the internet to find other solutions for this problem but I have not found anything yet. If anyone figures out something robust please post so the rest of us can fix this problem. I waited for the pressurization feature until pulling the trigger and I am glad I waited! Everything is well thought out, the tri-clamp fittings work great. If you get this, I recommend getting the temp sensor/probe setup. This makes it so easy to keep your beer at the exact temp you want. When cold crashing, I'll pressurize the conical a few psi to account for liquid contracting as it cools. Learned the hard way to do this after sucking in through the blow back. When dissembling and cleaning the small bleed off valve that prevents over pressurization, make sure you pay attention to the way the small insert faces relative to the spring and lid. Took me a call to get it back right, as it looks like it might be backwards even though it is correct. The gasket should be placed on the conical with the rounded part touching the lid. Again, I learned by doing it wrong but was able to talk to the morebeer guys at an AHA show and got the right setup. The gaskets that I got with the add on pieces like the temp probe are different than the ones that came with the conical. At first I didn't think it mattered, but I had some pressure leakage early on and solved it by keeping the original gaskets fitted to the original parts. Doesn't make total sense but it works for me. Get this if you can! Easy to assemble, disassemble, use and clean. Everything has worked perfectly. The extension legs make the unit unstable. Haven't tried out service on the unit yet, but will be shortly as the lid clamp fastener bolt got bent. Yeast harvester works well and lets you be more economical with your yeast. The only negative is the cost. If I could afford it I would have several more of these conicals. They really improve the brewing experience. The quality of my beer increased exponentially when I got this fermenter and temperature control. Every professional brewery has a larger version of a conical fermenter and there are so many obvious reasons why but maybe the best one for a home brewer is it helps transform the process of making beer from a work to fun. 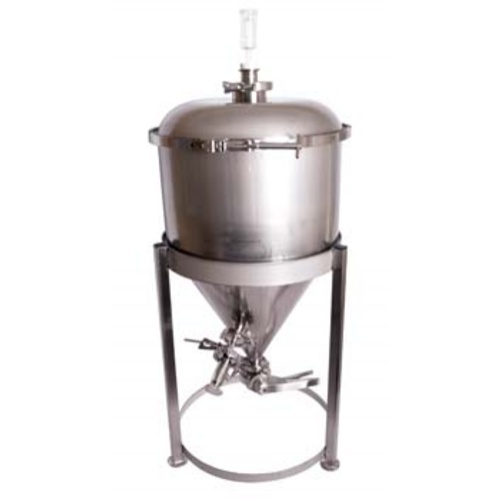 These More Beer fermenters are the best of the best - with all stainless construction, a large butterfly dump valve that seals tight, and the all tri-clamp connections. Sanitization after the boil is critical and these fittings make it easy to clean and sanitize. The cone shape design lets you easily dump the trub and harvest yeast without needing any secondary fermenters. I'll pump the wort in from the boil kettle through the valve at the bottom and pressurize it with CO2 after fermentation is complete so the finished beer is transferred to the kegs with zero exposure to oxygen. The fermenter by itself is impressive, but best setup is to put the conical in an upright freezer that you connect to a temperature controller for 1 deg accuracy on your fermentation. I think this is superior to their heated/cooled conicals, as it lets you lager in the heat of summer or hold a high fermentation temperature in colder months. I debated back and forth on whether all this was needed due to the cost, and in the end of the day the improvement on my beer was so dramatic that I'll never look back. I own other conicals but were unhappy with several of the design choices so i decided the next one would be from morebeer, I have to say the quality of this fermenter blows the others out of the park. - the angle of the cone really helps when the yeast and trub are settling out. A plus over my other larger fermenter. 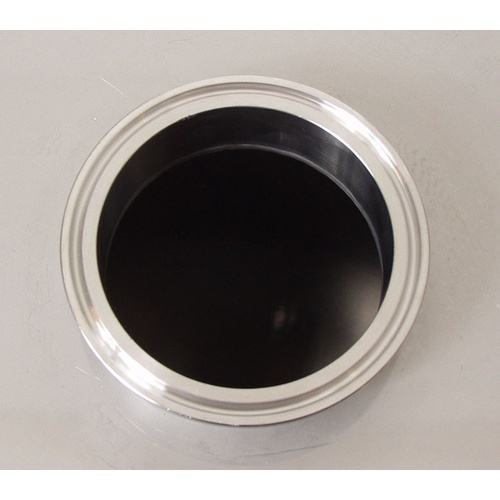 - all fitting are sanitary, the lid and lid gasket are easy to use. I dont really have any complaints at this point and am very happy with this fermenter. My next conical will be another morebeer. How Did I Live Without One? I have a 7 gallon Blichmann NPT conical that I still use and like. However, I Love my new 14 gallon MoreBeer! conical! Triclamp fittings as standard, the great fabrication quality, and the customer service have been outstanding. The first time I used my conical the sample valve would drip unless I cranked down on it very hard with a wrench. I emailed MoreBeer! customer service and no questions asked they sent me a replacement valve very quickly. I was quite impressed with their service. As for using this conical, It is so easy to assemble, disassemble, clean, and use. They have put a lot of thought into it's design and its evident once you work your first batch through it. Accessories are also plenty with this conical. This thing can be blinged out as much as you want. Great product! I had been doing 5 gallon batches in buckets up until now. When debating my move to bigger batches, a conical came into play. I searched countless reviews on different makers and decided upon the MoreBeer! I am so glad I did. My first batch was easy and a dream. As a previous post stated, get the 15" extensions and casters if you can. Makes kegging and moving around a breeze. The unit with the extensions is extremely sturdy. I also got the blow off kit and assembled my own T-connection that it connects to. Those parts are available onsite as well. My only nitpicks are that I wish the inside had a smoother finish as I have had difficulty cleaning it a few times and that my original sample valve was not working very well. Morebeer replaced the valve, their customer service is second to none. I made my own blowoff fitting with a thermocouple tube so that I could fit it into my freezer as the one Morebeer offer was too tall. Had been debating on a conical for a while, have 2 of the Spiedel 14.7 Gal fermenters-that work great by the way- but they lack the real benefits of a conical. I have used both now and can say that they both have their benefits. The Spiedel allows you to see the fermentation and is relatively inexpensive so I would recommend it for anyone venturing into the 10 gal batch range. It is also $60 vs. 900, so for most buyers is an obvious decision. The only real drawback that I have found is that you still have to rack to a secondary and to do so you have to find a way to attach a hose to the spigot. I used a hose and clamp, but it still sucked air in. It?s also a two man job to try to get as much out of it as you can. By the time I am in the fermenter I want to reduce as much loss as I can, and it takes a decent amount of tilting and adjusting to get the last of your beer to the spigot. Besides that they work great and I would recommend them. I still use them to this day. Now, as for the Conical, what can I say but what a great investment. Easy to clean, use and drain! If you have the money and really want to step up your game, then congrats, you have reached your destination, just press Add to Cart? and don?t look back. I have seen and used my friends Blichmann Fermenter and it is good but I honestly like the MoreBeer version well_more. The only feature that I have debates back and forth on still is the lifting handles. The Blichmann has handles and the MoreBeer version doesn?t. Having said that though, the MoreBeer version is not bolted to the frame allowing for easier cleaning and adjustment of where you want the valves to be positioned. You really don?t want to try to lift 10+ gals of wort, but if you wanted to make adjustments after the fact, there is not really anywhere but the lip of the lid to grab. Maybe an add on feature for the future gents_cough cough ?. Besides that I could not be happier to have it in my collection! Long winded story later, that?s my insight into the fermenter. Yes I would buy it again and would recommend it to my friends and anyone who is interested in a 10 gal conical.